Home / Travel and Living / Doodhsagar falls by Train- Disaster waiting to happen! Doodhsagar falls by Train- Disaster waiting to happen! Doodhsagar is a huge eye catching waterfalls in the western ghats, located in the border of Goa and Karnataka state. Thanks to couple movies which showcased this falls in recent times, tourist inflow to the falls has increased exponentially over past one year or so. However, poor logistics and travel options to Doodhsagar falls is forcing tourists to take risky approaches which may result in fatal accidents one day. Option 1: Hire a local bike. ‘Pilots’ or bike taxis as these yellow board two wheeler are called, take tourists close to the falls and back, through some bike only routes identified by these bikers. They charge a hefty 500-700 Rs per person for the return trip, give very limited time at the falls and not very economical or comfortable. Option 2: Train: Next and the only other option to visit Doodhsaagar waterfalls during rains is by using the services of Indian Railways. However, Indian railways has turned a blind eye to the revenue generating opportunity they have in front of them. By not providing viable train options to visit Doodhsagar falls, IndianRailways is enabling its staff to earn illegal revenues. Goods train drivers ferry tourists in the engine compartment, regular tourists who board reservation coaches are made to bribe the TTEs. All in all, both tourists and Indian Railways would suffer while a few handful of people make their bounty during each monsoon season. (I am told drivers don't demand money).In this post, let us explore the train option to reach Doodhsagar falls in little more detail. Below: One guy wants his photo to be clicked with an approaching train in the background. Think of the confusion driver of the coach would have. If he breaks on an uphill track to save this guy, train may loose momentum and may slide backwards resulting in accidents. Though there’s a station named Doodhsagar falls, it doesn’t appear in the schedule of any of the trains that pass through the falls. Trains stop at Doodhsagar falls station for a few minutes, but reportedly for operational reasons. During this brief period, those visiting Dudhsagar are required to get off the train or board it, directly on to ground level, as there’s no raised platform in Doodhsagar fall station. Qulem (Station Code QLM) and Castlerock (Station code CLR) are the two stations before and after the falls where one can buy tickets. · There’re no passenger trains between Kulem and Castlerock. All are express trains plying long distance. · These trains will have only one or two general compartments- we won’t know where exactly these compartments are and even if you find them, they are jam-packed and hardly anyone can squeeze in. So only option for tourists is to get into sleeper coaches. · You will need reservation tickets to enter sleeper coach. You can’t book them online in advance because unless seats are available or in RAC or within permissible wait-list count, system won’t let you book. If you try to book for a weekend date, in all probability the seats will be sold out. (I tried for a weekend date 6 weeks from now and I got ‘Regret’ message). There will be very little quota allotted to these small stations like Kulem and Castlerock. For a half day picnic we can’t really plan months in advance and book a sleeper coach ticket with specific passenger names, age etc. · So at Kulem or Castlerock stations, you will only be able to buy general ticket. (General ticket between QLM and CLR costs Rs 35 per person). So with a general ticket, it is an offense to board reservation coaches. TTEs will try to extract bribe from passengers without giving receipts or for those who insist receipt, they try to scare them stating actual fare is some big amount like Rs 350/500 etc and they are better off giving 100 Rs to TTE and keep quiet. Designated penalty for traveling in sleeper coach with a general class ticket is Rs 50 between QLM and CLR. You can insist on a receipt and TTE will be forced to issue a receipt after collecting only Rs 50 per person. Do not bribe them. · We bought both onward and return ticket at Kulem, because Doodhsagar falls station has no ticket counter. Many who don’t know this, won’t be able to buy return ticket and they will be exploited even more by the TTE, by collecting bribe of even Rs 1000 per person, depending on how wealthy the party looks. · There’re very few trains between QLM and CLR. If you miss them, you either need to walk all the way, or travel unofficially on goods train, like many do, risking their lives. · Doodhsagar station has no platform. One has to jump off the train right on to the track. We were scared train will stop only for 2 minutes here, but probably because of the crowd, it did stop little longer- like five minutes or so, which was adequate for everyone to get out and in. · If you go from Kulem, you get to see the falls first before getting off the train. But those coming from CLR side wouldn’t know exactly where to get down. A few people were told train will stop right next to the falls, so they didn’t get down at the Doodhsagar station. 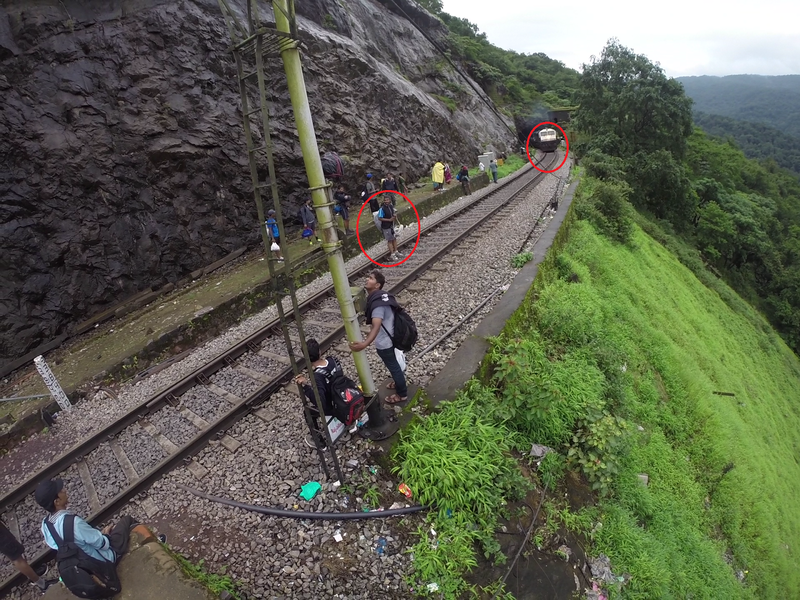 When they realized train wouldn’t stop in front of the falls, few attempted getting off from moving train, others had to get down at Sonaulim station and walk back. Thus, despite having huge tourism potential, Indian Railways hasn’t made any attempt to introduce some passenger trains for tourists visiting Doodhsagar. Thus they are enabling TTEs to make a killing from tourists, (I am told coach drivers don't take money- not sure) while tourists risk their lives to travel to Doodhsagar falls, by standing outside the engine coach, by jumping off to the track or trying to board/alight from a running train. 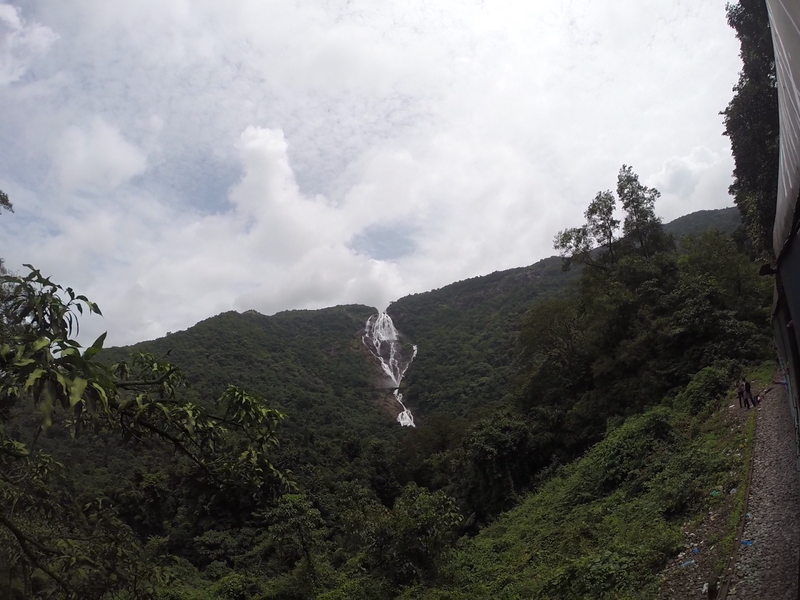 Option 2: Medium Walk: Get down at Dooshsagar falls station, walk down all the way to Sonaulim station (approx. 5-6kms)- this route is very scenic and if you’re lucky, you can click the train passing in-front of the falls. From Sonaulim take the next train or try hiring a taxi. Option 3: Long walk: Get down at Castlerock and trek all the way to Doodhsagar or get down at Doodhsagar and trek all the way to Castlerock or back to Kulem, if you have the time and energy to trek for about 10-12kms. I have made below video on Doodhsagar falls, which shows some of the risk involved. Kindly watch and share the same to help spread awareness. · Penalize/suspend staff who collect bribe from tourists, drivers who take tourists in driver coach. Doodhsagar falls was the most exciting place during our Goa trip. There were lots of cloud, moisture in the air and occasional rains, so I didn’t get best possible photos. But that is fine, because I got to see the falls at its best. Photos can wait. Agree with most of your concerns. However found your mention about the Good's train pilots making money offensive. Have been lucky to be making trips almost on a yearly basis here and never once have they extorted money. :) TTE's, I agree.. You might want to remove their references please..
Amazed to see the sea of people ,when i went there 6 years or so ago ,there was hardly anybody. I dont agree with you.Doodhsagar is a dangerous area with many people being washed away each year ,google for more information. Doodhsagar is actually in the middle of nowhere -forest area to be precise,there is absolutely no place to build a station there,its a waterfalls -i dont think its prudent to even think of building a station there.And that area is prone to landslides heavily. Everything is due to a precise reason. If people are foolish ,there is no dearth for people's foolishness -like the guy standing for photo in front of the train.I agree with Mr Rao,goods train drivers stop out of pity if not for anything else.Also as you pointed out people should know what is the fine amount and pay Rs 50 and take receipt.All the points you quoted as pain points like people not knowing where to get down etc is utter foolishness ,they only have themselves to blame and not anyone else. Eg: I hear similar stories when i used to trek -no mobile signal when starting a trek near a forest ,well if you want all the facilities you better go to a human inhabited area -why go on treks ? I didn't say Doodhsagar is dangerous. What I meant is the way people get on and off the train, travel on engine compartments etc can prove fatal someday. Thanks for your comments and views. Yes, what you have written is totally right. I have heard that walking on Railway track is an offence. But here hundreds of trekkers walk ! When we visited Dhoodhsagar, there were atleast 250-300 people on that Sunday . In Dhoodsagar station , there was a huge struggle to board the train. We had boarded the train at Kulem station. Beautiful pictures. What lense did you use? Good information. I found the man standing on track stupid. There are many such jokers all over the country. Wonderful post. Dudhsagar is definitely an unexploited tourists destination from the tourism board's point of view. Hope tourists apply some commonsense before posing for such selfies. Nice post. I truly appreciate your concern. @Abhijit: First 2 pics were clicked with Nikon 18-55, last few were clicked using gopro. Excellent write-up! I just have one question though. While going from Madgoan to QLM/Castle Rock, Dhudhsagar Falls station comes after Castle rock or before it? Got confused. Suppose, I am travelling from Madgoan railway station to Dhudhsagar, where should I get down to reach the falls? Is it after QLM? or after Castle rock? Or in between these two stations? You can get down at the station named Doodhsagar falls. Assuming you're starting from Goa side, it is 2nd station after QLM... You will see the falls first on your right and then next get down after train crosses a tunnel. Thank you ShriNidhi -- this is the exact information I was looking for -- from few days as I have planned to visit this place in July 2015 -- May be late by your blog time. Also when I think -- Railways can just add couple of Seating couches with 8 doors to all engines goes up & down from QLM to CSR. So those can be utilized by tourists even on goods trains. That way IR do not need to add any passenger train [if they have tight schedule] and color them like doodh livery [For Doodhsagar Falls] as they did it for Amul Engines. Nowhere I've seen attaching seating coaches to goods train. It serves purpose but may not be right from regulatory point of view. Not necessary for railway to develop basic fascility every beutiful spot. Railway has some other buisness also. Indians have habit to blame govt for every thing. Someday these stupid may say allow us in BARC or any military base and treat us as tourist and give us fascility for free. Agree. Just that there is no other alternative and railways can cash in on this opportunity if they provide some services. The write up is good, but there are some points he stated due to his ignorence. First of all i would like to suggest you to get down Quilem station and truck from there to fall. It may take 2 to 3 hours and risky, but i am sure that it will be a good experiance. The writer stated that we can get down the Dhoodhsagar Falls station and all trains have stop there. But from the best of my knowledge it is not a commercial station, they are stopping trains there due to signal isues while it is a single lane. I had the experiance that several trains are not stopped there. So that there is only some probeblity to get down the staion. Please beware of these issues also. @Sunil- You mean trek not truck..
Any update if we can trek from Kulem on rail tracks?